The Double D Investing Haven is the Dollar and Danish kroner. Last week JGAM sent me the note below about two haven currencies. There is a good chance that this week will end with relief on markets as a successful Spanish bond auction and positive economic news from the U.S. yesterday caused global equities to rise for the first time this week. At the Spanish auction buyers asked for 6bn euro worth of debt, almost twice the initial bonds on offer. Monday risk assets suffered significant losses as investors had second thoughts on last week’s EU summit agreement. As Martin Wolf, chief economics commentator, wrote in the Financial Times on 14 Dec, “A disastrous failure at the summit… to tighten the screws on fiscal deviants. It may feel good. But it will not work.” Also, Italy auctioned 7bn euro of 1-year bonds at a yield close to 6%, slightly lower than an auction one month ago but still an extreme and unsustainable level. Tuesday, the U.S. Federal Reserve published a standstill statement as the central bank on the one hand has become more optimistic on the U.S. economic outlook, and on the other hand remains concerned about the potential damage the eurozone crisis may have. Wednesday, stocks and the euro continued to sink. The euro declined below 130 U.S. dollar for the first time since January 2011. The dollar not only strengthened against the euro, the dollar index also jumped to 80.5, close to the high for the year. The general dollar rise is an indication of investors seeking safe haven. Something similar is happening to the Danish kroner. It’s strong and therefore, the Danish National Bank lowered its leading interest rate another notch down to 0.7%, now 0.3% points below the euro level. Let’s look at those currencies compared to the BRIC (Brazil, Russia, India and China) as well as the euro. A dollar euro chart from www.finance.yahoo.com shows woo thegreenback is rising thugh far from where it skyrocketed in the 2009 crisis. The long term fundamentals of the Brazilian currency are much higher than the dollar’s so the dollar offers protection now but once its gets around two real per dollar there will be some good opportunity. Brazil is a good value market with strong long term potential and investments in the Wisdom Tree Dreyfus Brazilian Real Fund can add a solid holding in a multi currency portfolio. 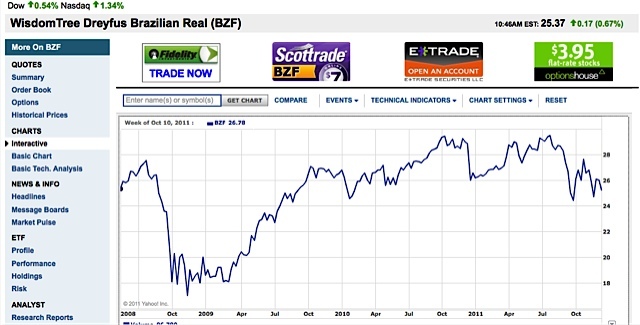 As this fund price falls… as is shown in its chart (also from www.finance.yahoo.com), this market’s downturn creates greater value. Get multi currency updates faster. My normal messages take time to post and mail. To speed up the process I have added Twitter to our service. I sent a tweet leading to this site last week. Tweets also give you a way to pass on the information quickly to others that you feel will benefit from this information. Get more multi currency information. International Club members and Multi Currency Portfolio Subscribers can read the full Cash in Crash – Brazil Brazil report at their password protected site here . The Cash in Crash – Brazil report can be purchased at www.amazon.com to be read on the Kindle, $4.99. Learn how to get a Multi Currency Portfolio password. Join us for a year and receive all our services, seminars and courses FREE.